This is one of the nation’s oldest state amateur golf championships. The championship originated in 1912 and was held at Pebble Beach Golf Links from 1919 until 2006. In 2007 the CGA broadened the scope of this prestigious championship by rotating the weeklong event to selected courses throughout the state, alternating between Northern California and Southern California every other year. Players must have an index of 4.4 or less, qualifying is available statewide for both NCGA and SCGA players, players may only attempt to qualify once. The Championship consists of 156 players who will play 36-holes of individual stroke play to determine the 32 player match play field. The final match is played over 36 holes. During the stroke play portion of the tournament a simultaneous team competition takes place between the NCGA vs. SCGA competing for the Roger Latham Cup. 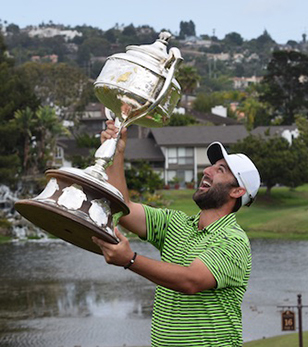 If there was a theme song for Bobby Bucey's weekend run to the California Amateur Championship title, it would surely be "Won't Back Down" by Tom Petty. He's just 19 years-old and the third time is the charm. Next year's championship will be held at Monterey Peninsula CC.